African Methodism had its beginning in Fort Worth with the coming of Rev. Moody, a wandering circuit rider, and five other people. The organization took place in 1870. No church building or property was owned in Fort Worth at the time of the original organization; therefore, services were held irregularly in the homes of members. Among the five who gathered with Rev. Moody was Mrs. Emily Patterson, great-grandmother of Dr. James E. Guinn III and Dr. Edward W. Guinn, both of Fort Worth. The first formal meeting place was a one room frame house located in the 1000 block of East Second Street. A few months later the meeting place was a shanty with boxed-in walls and a cobblestone floor. In 1873 a small one-room brick building was the place of worship. The membership increased, interest in the church mounted and a large red brick building was constructed for their worshipping place. In 1887 the church started a major construction project and was having a financial struggle under the leadership of Rev. W. E. Reed. The obligations of the church were met on June 6, 1891 and release of the Deed of Trust was filed. Deed records indicate that the property on which the church is presently located was purchased on March 2, 1878. The trustees were George Reed, R. Lawson, and H. Thomas. The pastor was Rev. George Taylor. There was a prevailing conviction in the mind of the founders of the church that eventually a majestically imposing structure would be its permanent place of worship. With this in mind, the members later decided to raze the large red brick building on the corner of First and Elm Streets and build a new church in its location. In 1912 the membership temporarily moved to Second and Crump Streets. The members worshipped in a tent for two years until the present church was erected. The contract for the construction of this new edifice was awarded to William Reed and Sons of Fort Worth. The completion date was set for two years later. The new pressed brick church was built during the pastorate of Rev. R. S. Jenkins on the lot that had been purchased in 1878. On Sunday morning, December 22, 1912, more than one hundred persons, whose names are carved in a white marble slab in the north vestibule and whose names are etched in the art glass windows, unselfishly gave $25 each. That effort was the beginning of the founders' dream that ended with a majestic, modified Gothic structure which the church currently occupies. The building of the new $20,000 Allen Chapel A.M.E. Church and its dedication on July 22, 1914 were the crowning accomplishments of Rev. Jenkins' career. The laying of the cornerstone was a very memorable event which culminated the long and arduous efforts to provide a suitable temple in which to worship Almighty God. It brought great joy to those who had given of their money, time and labor to this project. Pastor R. S. Jenkins, along with advice of members and the architects, planned everything. The superstructure, as it now stands, is a beautiful pressed brick. The church is perpendicular Gothic, an architectural form taken by most noted cathedrals and churches of the world. The front of the church faces east while the chancel, which includes the choir, faces west. Upon entering the church, one faces the audience in the sanctuary. This was a special design requested by Rev. Jenkins. The structure is 48 by 100 feet and has a seating capacity of 1350. It has a main auditorium, a gallery, a basement, and nine extra rooms. These rooms are used by the boards, committees, and the auxiliaries. The eclectic beauty of the interior sanctuary gives one a wonderful feeling of devotion and tranquility. In addition, the evening sunlight, which shines through the stained glass windows, greatly enhances the serene beauty of this majestically gothic structure. To compliment this architectural masterpiece, Allen Chapel was privileged to have the tubular pneumatic 1911 Estey Pipe Organ installed in the sanctuary on July 3, 1923. 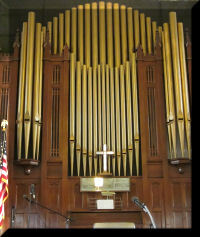 The pipe organ, as pictured below, is one of the most beautiful musical instruments in this country. It consists of many sets of pipes which are sounded by compressed air and played by means of several keyboards. A fitting addition to this beautiful church, the organ was purchased during the pastorate of Rev. George Sims whose leadership followed Rev. R. S. Jenkins. The church organist was Mrs. Mattie Daniels Loudd. She served under the direction of ten (10) pastors and professionally manipulated this extraordinary musical instrument for more than 42 years. She was senior choir organist and was elected organist for the 10th Episcopal District of the North Texas Annual Conference where she served until her homegoing in 1985. Mr. Elvis E. Guinn and Mr. Frank Jones (both deceased) have the distinction of having served on the official staff for sixty years each and both united with the church in the old brick building before the present church was erected. Finally, the history of the church would not be complete without the story of the Sunday School. From the best records available, the Allen Chapel Sunday School was organized in the 1870s and classes were held in the sanctuary. Mr. E. M. Wilson (deceased) most recently served as superintendent the longest tenure which spanned 49 years. 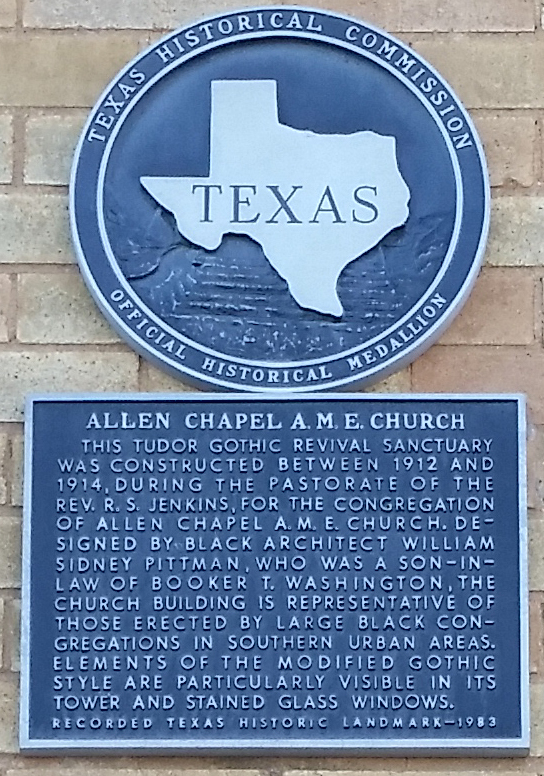 n September 1982, Allen Chapel African Methodist Episcopal Church became a State Historical Marker Site and in September 1983, the church received the Texas Historical Building Medallions below which the State designates as a Texas Historical Landmark. 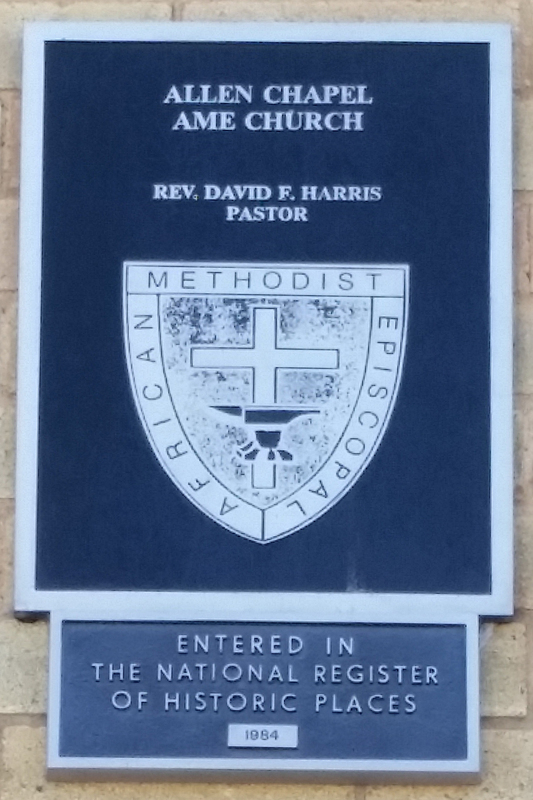 In September 1984, the church was officially notified that Allen Chapel A.M.E. Church had been recorded in the National Register of Historic Places in Washington, D.C. A plaque symbolizing the African Methodist Episcopal Church was made and stationed on the east exterior of the church. On September 23, 1984 during the 114th Anniversary, the church's Symbolic Plaque and a simulated National Register Plaque were unveiled and dedicated with State and Local dignitaries in attendance for the ceremonies. Allen Chapel has been served by a long list of illustrious and distinguished pastors and each gave his utmost efforts in reaching worthwhile goals. NOTE: The above information on the history of Allen Chapel was extracted from the history given in the 1990 Revival Booklet, 1985 North Texas Conference Booklet (65th Session) and current members.